﻿﻿ Merry Christmas and a Happy New Year! This is the time of the year when, regardless how busy and hectic our seasonal preparations, we take the time to reflect on the sentiments of the Christmas season and think thoughts of goodwill to others. In particular, we think warmly of those closest to us and those who have been especially kind over the past year. There are many to thank and apologies in advance if I 've missed anyone. May you all have the merriest Christmas and the happiest and most prosperous New Year! Produced, directed and edited by Yurij Luhovy, it tells the story of the Ukrainian settlement in Quebec from ﻿﻿﻿﻿1891 to 1945. ﻿﻿﻿﻿﻿﻿﻿﻿﻿﻿﻿﻿﻿By means of rare, salvaged photographs and personal accounts, the 28 minute film depicts the formative years of the first two waves of Ukrainian immigration in Quebec: those who arrived before the First World War and those who came in the inter-war period. Ukrainians in Quebec was originally released in 16 mm in 1979 following four years of research, interviews and filming. It captures aspects of the cultural, organizational, religious and political development of the Ukrainian community in Montreal, as well as in Val d’Or, Rouyn Noranda and surrounding areas in Northern Quebec where many of the descendents of the original colonists still live. Rich in still photographs and vintage film footage, the documentary also recalls the establishment of the Sheptytsky Colony at Lac Castagnier in the Abitibi region and is a lasting tribute to those early immigrant community builders no longer with us. Interviews with French-Canadian eye-witnesses describe daily life at Spirit Lake internment camp. Footage shot of the original internment prison barracks still standing at the time is also shown. This documentary was the first film to expose the unjust internment of Ukrainians during WWI and place Spirit Lake internment in a wider context of early immigration to Quebec. Ongoing screening of the documentary will be a permanent part of the Spirit Lake Internment Interpretive Centre to open in 2011. Restoration of Ukrainians in Quebec was enabled in part with the financial support of the Shevchenko Foundation and the Camp Spirit Lake Corporation. The original version was partially supported by the Department of Multiculturalism, Secretary of State. This was the first documentary made by filmmaker Yurij Luhovy who had just graduated from film studies at Sir George Williams University (now Concordia). It began his journey in documenting aspects of Ukrainian and Ukrainian-Canadian history so that knowledge of the past always remains a part of our present and future. 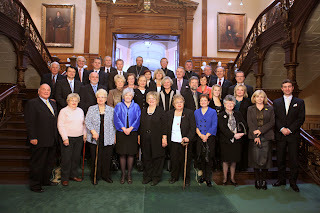 On November 24, 2010 in the Legislative Assembly in Toronto, Ontario together with numerous representatives of the Ukrainian Canadian community, I had the privilege of witnessing MPPs from all three parties put aside partisanship to pay fitting tribute to former Ontario Cabinet Minister and Member of Provincial Parliament the Honourable John Yaremko who passed away on August 9th of this year. The poignant tributes on the passing of John spoke to the loss felt by elected public office holders in the Province of Ontario and especially in the Ukrainian Canadian community in Ontario and beyond. ﻿﻿John dedicated twenty-five years of his life to elected public service at Queen’s Park. Everyone spoke with tremendous respect for what he accomplished as a parliamentarian and Minister of the Crown in Ontario. However, his active public service continued for decades after he retired from elected office. Together with his late wife Mary, the Yaremko’s envisioned and funded legacy projects in a string of institutions of higher learning in Canada and in his parents' ancestral homeland of Ukraine. On a personal note, my first recollections of John were when I was a young boy of 6 or 7. I remember well John’s annual visits to my grandmother in the apartment above our bakery. Every Christmas John would arrive with poinsettias and every Easter he would arrive with a bouquet of Easter Lilies for my grandmother. He often retold to me the story of his very first election campaign in 1951 and how my grandmother’s steely principles played a crucial act in that campaign. One of the first to put up “Yaremko” campaign signs with the “alien” name Yaremko was my grandmother. She agreed to place John’s signs across the 60 foot fence fronting her business on Queen Street West even though there were those who said she risked her just-opened neighbourhood bakery business. Sure enough, on the first night a group of hooligans knocked down the fence along with the Yaremko signs. The next day a dejected John came to my grandmother to apologize saying he would remove the signs and offering to build a new fence. My grandmother said: " No, let the fence and signs lie there throughout the campaign.” It proved to be a pivotal decision. Even those who considered the Ukrainians and Poles in the neighbourhood “DPs” [Ed: a pejoritive term for displaced persons] were shamed by this hooliganism and it mobilized the New Canadians, in fact, the entire immigrant neighbourhood, to vote. It became a seminal election in which for the first time a Ukrainian Canadian, a so-called “DP”, was elected to public office in Ontario’s Legislature. I will also remember fondly, and will always be thankful for, the innumerable encouragements I received from John as I contemplated embarking on my pursuit of elected public office. A couple of months before his death, I had an opportunity to speak to John. At that time he again offered encouragement and reminded me that I carried an additional political responsibility in that I also represented our ancestral heritage and culture. I am convinced that just as John Yaremko played a role in our family’s integration into Canadian politics, there are innumerable other families in Toronto and across Ontario with similar memories. As well, John will also be fondly remembered by Hungarian Canadians who considered him an honourary member of their community. During the 1956 Hungarian uprising, he immediately travelled to Ottawa to forcefully and successfully make the argument to the federal Minister to put in place special processes to bring the desperate Hungarian refugees from the failed anti-Soviet uprising to Canada. The tributes to John Yaremko on the floor of the Legislative Assembly of Ontario from MPPs representing all three political parties more than half a century after his first election attests to John’s impact as a legislator. His good acts will continue to resonate for decades through the many Yaremko educational initiatives. Two excellent articles about John Yaremko were published following his death in the Toronto Sun (article by Ted Woloshyn here) and Toronto Star (article here). Last month a new radio program looking at the media industry around the world debuted on shortwave and internet radio. The 55-minute program, Media Network Plus, broadcasts monthly. It usually includes coverage of the media in Ukraine on the program, since I am one of the announcers. :-) The other is executive producer of the show, Keith Perron of PCJ Radio. 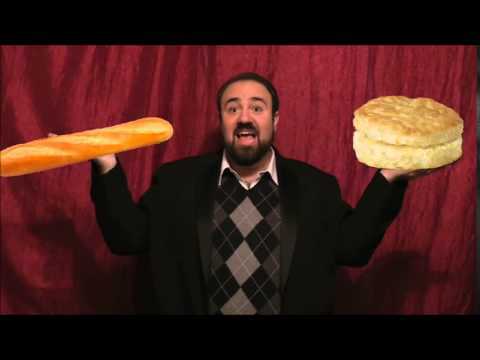 So the second broadcast aired yesterday ... amid considerable confusion. The first transmission of the show is scheduled for the 4th Friday of the month on Radio Miami International (WRMI) at 7 pm EST (0000UTC Saturday) on shortwave frequency 9955khz and streaming live on the station's website. However, it went on the air two hours late (at 9 pm EST) due to technical difficulties at the station. Since Keith is in Taiwan and the time difference from BC is 16 hours, he missed out on a good night's sleep trying to get to the root of the problem. It turns out that because of the American Thanksgiving holiday there was no one on hand at WRMI to deal with a mechanical failure. In the meantime, if you were following me on Twitter you will have noticed a rather frenzied exchange with Vasyl who was also trying to catch the show on WRMI's live stream ... but I suspect he may have given up by the time the program finally aired. Hopefully he'll catch it on the weekend. It also streams on the PCJ Radio website Saturday and Sunday at 0700UTC (2 am EST) and 1600UTC (11 am EST). The podcast will be at the PCJ website here sometime after the final live transmission. Next month's broadcast will air (barring any more holiday system glitches!) on December 24th and will feature an indepth look at deteriorating press freedoms in Ukraine and, on a lighter note, radio bloopers that Keith has collected over the years... including some of mine. I can hardly wait for that (...she said sarcastically). Anyway, I hope you'll check out the show and let us know what you think of it ... what you like and what you think would make it better. Leave a comment here or send an email to either Keith or myself. Duzhe diakuyu! I am honoured to join Canadians in the solemn commemoration of the 77th anniversary of the Holodomor. On this day, we remember the millions of Ukrainians who suffered and perished during one of the most terrible crimes in history. Millions of men, women and children – predominantly Ukrainian – died of starvation under Joseph Stalin’s oppressive regime. Canada’s heritage is forever connected to this unimaginable tragedy through the more than one million Canadians of Ukrainian decent, many of whom lost loved ones in that time of horror. The Holodomor is a part of the past that we as Canadians must never forget. Two years ago, our Government was proud to lead an effort in Parliament to officially recognize the Holodomor as a genocide and establish an annual day of commemoration on the fourth Saturday of each November. I was deeply moved by the vivid depictions and sad memories of this humanitarian catastrophe preserved at the National Holodomor Memorial, when I visited Kyiv this October. I was reminded of the Ukrainian communities back home that honour the memory of victims of the Holodomor with monuments in parks and public squares. During my visit to Ukraine, I was impressed by the profound friendship our two countries share. Canada stood against the oppression of Ukraine during the two World Wars and the Cold War, and was the first western country to formally recognize its independence from Soviet communism. As our friendship grows, Canada will continue to support Ukraine in its journey toward strengthening freedom, democracy, justice and human rights. As Canadians, we admire and respect Ukrainians’ pursuit of liberty and freedom, their spirit of independence, and their courage and determination. The Rt. Hon. Stephen Harper, P.C., M.P. Joy Smith, Member of Parliament for Kildonan–St. Paul in Manitoba, will join Ukrainian-Canadians across Canada this weekend as they solemnly remember and mourn one of the most tragic chapters in Ukrainian history, the man-made genocide Holodomor. 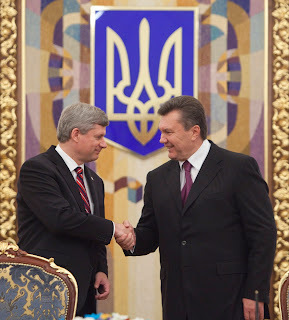 “Canada has long been a close friend of Ukraine. By joining Ukraine in remembering Holodomor, we deplore the acts and policies that brought about mass starvation and the deaths of millions of people. We are convinced that exposing violations of human rights and restoring the dignity of victims through acknowledgement of their suffering, will guide future societies and help to avoid similar catastrophes in the future. 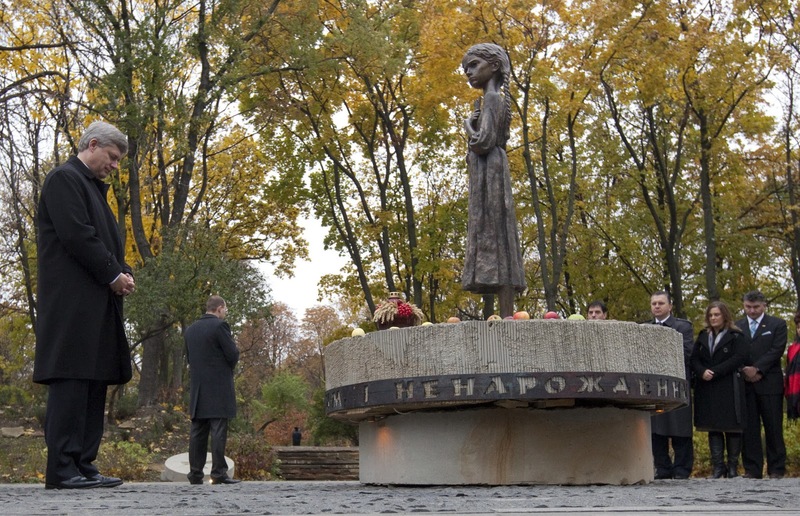 Through the strong leadership of our Prime Minister, Canada is committed to commemorating the victims of Holodomor. In 2007, Canada co-sponsored Ukraine’s motion honouring the millions who perished in the Famine at UNESCO. Last month, during Prime Minister Harper’s visit to the Ukraine, he solemnly remembered Holodomor as he placed a pot of grain in front of a commemorative statue called ‘Sad Memory of Childhood’. 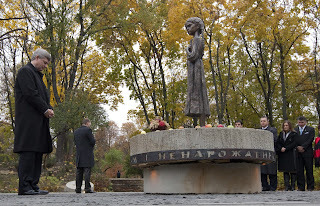 Canada officially recognizes Ukrainian Famine and Genocide (“Holodomor”) Memorial Day on November 27, 2010. 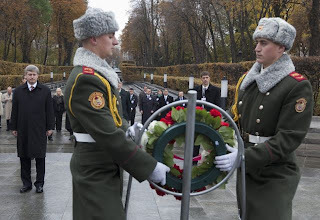 This Memorial Day is a result of the passage of Bill C-459 in 2008 that established the fourth Saturday of every November as the national Memorial Day for Holodomor and officially recognized the Holodomor as a genocide. MP Joy Smith currently serves on the Executive of the Canada-Ukraine Parliamentary Friendship Group and served as the Chair in 2008. It is indeed gratifying to see politicians unite in non-partisanship to commemorate the Holodomor, a 20th century genocide that so many still deny. Would that this commemoration were taking place in Ukraine, where the Holodomor occured. In 1932-33Stalin and his henchment starved millions of Ukrainians to death for the sake of communist ideology. This was not the first, nor the last, attempt by the Kremlin to eradicate Ukrainians. It happened in 1921-23 and again in 1946-47. I am proud of those Canadians in public office who have the backbone to put politics aside and call a genocide a genocide ... and (unlike the deniers who debate the "numbers") honour the memory of millions of innocents who perished in this heinous crime against humanity. “This week is National Holodomor Awareness Week, a time for all Canadians to remember the terrible famine in Ukraine which killed millions between 1932 and 1933. “The Government of Canada is committed to remembering the victims of the Holodomor and heightening international awareness of what happened more than three-quarters of a century ago. 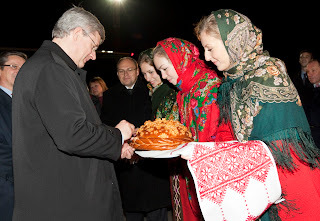 “During his trip to Ukraine last month, Prime Minister Stephen Harper called the Holomodor ‘one of the great crimes of history.’ He laid a symbolic pot of grain at the foot of a commemorative statue called 'Sad Memory of Childhood', depicting a wraith-like young girl. “Honouring those memories is why in 2007 the Government of Canada proudly co-sponsored Ukraine's motion at UNESCO to honour the millions who perished in the famine and to acknowledge that their deaths were caused by the cruel actions and policies of a totalitarian regime. “In 2008, Parliament unanimously passed a bill to establish a Ukrainian Famine and Genocide Memorial Day and to recognize the Ukrainian Famine of 1932–33 as an act of genocide. “Establishing a memorial day and recognizing the Holodomor as an act of genocide expresses the fundamental values Canadians hold dear: freedom, democracy, human rights and the rule of law. “It also honours the more than one million Canadians of Ukrainian descent who have played an important role in building our society, taking great pride in both their traditional heritage and their adopted home. “By helping people remember the victims of the Holodomor, we remind Canadians that we share a responsibility to ensure that similar atrocities never happen again. “Throughout this week, and in the days ahead, many events will be held across Canada to commemorate the Holodomor. I will be honoured to attend one such ceremony this coming Tuesday in Ottawa sponsored by the Ukrainian Embassy and the Canada-Ukraine Parliamentary Friendship Group. “As Minister of Citizenship, Immigration and Multiculturalism, I join all Canadians, and particularly Canadians of Ukrainian origin, in solemnly marking the anniversary of this crime against humanity." You can find details of events across Canada commemorating the Holodomor here. Amnesty International is concerned that six people including Amnesty International activists and former prisoners of conscience were held for three days in incommunicado detention in Ukraine. Two of them report that they were subjected to beatings. All were detained in very poor conditions without access to a lawyer or any possibility to contact the outside world between Wednesday night and Saturday evening, when they were released. Ihor Koktysh, Iryna Tyutyunnyk, Tatyana and Vitaliy Tishchenko, Artsyom Dubski and Aleksei Zakshevskiy were detained in connection with an investigation into possession of cannabis in Zhytomir in North West Ukraine on 3 November. They were only released on Saturday evening after their lawyer went to see the Regional Prosecutor and demanded to see them. Ihor Koktysh, and Iryna Tyutyunnykh are the coordinators of the Amnesty International group in Zhytomir and they were preparing for a group meeting with four of their friends on 3 November. At 2pm police officers entered the flat without a search warrant by sending ahead a woman who claimed to be checking the electricity metre. Shortly after that five plain clothed police officers entered and restrained all those in the flat. When he complained that they were being subjected to a provocation, Ihor Koktysh maintains that he was forced to lie on the floor on his stomach and handcuffed. Artsyom Dubski alleges that he was beaten by police officers in the flat. They were made to wait for two hours until the owner of the flat arrived and gave written permission to the police to inspect the flat. Shortly afterwards police officers claimed to find 10g of cannabis in the kitchen. Amnesty International spoke to Iryna Tyutyunnyk while the flat was being searched, but then lost touch with the group. The organization later learned that they had been detained and taken to three difference police stations in Zhytomir region. Their mobile phones were confiscated and they were unable to contact anybody until their release. This case highlights a long-standing problem in Ukraine that people who are detained under the Administrative Code can be held by the police for up to three days without access to a lawyer. They are deprived of the basic guarantees that can protect them from torture and other ill-treatment. Although, under the Administrative Code detainees are entitled to a phone call to inform a person of their choice of their detention, they were denied this right increasing the risk of ill-treatment in detention. Amnesty International urges the authorities to conduct a prompt and impartial investigation into the actions of police officers in this case. In particular, to investigate the allegations that Artsyom Dubski and Ihor Koktysh were beaten by police officers, and that police officers gained entry to the flat under false pretences and without a warrant. Furthermore, Amnesty International calls on the authorities to make the necessary changes to the Administrative code to ensure that all detainees have access to a lawyer from the outset. Ihor Koktysh was detained in Ukraine for over three and a half years from 25 June 2007 following an application by Belarus for his extradition to face a charge of murder, a crime that carries the death penalty in Belarus. Koktysh had first been charged with the crime in January 2001, but was acquitted in December 2001. He then left Belarus for Ukraine. In his absence the case was reopened and he was charged again with the same offence in 2002. He was released from detention in Ukraine on 2 February 2010 after the European Court of Human Rights ruled on 10 December 2009 that Koktysh should not be extradited to Belarus due to the serious risk of torture or ill-treatment and the death penalty. The case against Koktysh for murder in Belarus is ongoing. Artyom Dubsky, an opposition activist from Belarus was sentenced to two years of restricted freedom in Belarus in April 2008 for his participation in a peaceful protest which was converted to one year imprisonment in July 2009. Amnesty International declared him a prisoner of conscience and he was released in May 2010 and moved to Ukraine in June. For more information please the Amnesty International website. The Ukrainian Canadian Congress announces the 2010 fundraising campaign to support Holodomor awareness and education. Beginning with a remarkable 75th anniversary commemorative year in 2008, the achievements of the Ukrainian community in raising awareness and gaining recognition of this genocide continue to resonate. 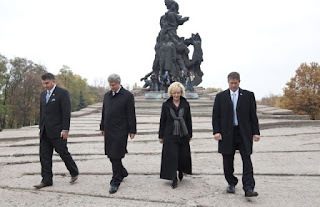 A successful tour of the International Remembrance Flame, recognition of the Holodomor as genocide by the federal government and five provincial legislatures, and the most recent tribute by Prime Minister Harper at the Holodomor memorial in Kyiv last month are only a few highlights of a successful campaign. The accomplishments to date are also a direct result of the community's generous financial support. The UCC's work, however, is far from complete. There are many more Canadians still to reach with the message that the Holodomor was genocide of the Ukrainian people and it must serve as a reminder to future generations in the prevention of similar crimes against humanity. Annual promotion of National Holodomor Awareness Week in November. All donations should be made payable to the UCC Charitable and Educational Trust with the designation of Holodomor Awareness Fund. Please send your cheques to Ukrainian Canadian Congress, 203-952 Main Street, Winnipeg, MB, R2W 3P4. Donations can also be made online. Help reveal the truth about the Holodomor. Make your donation today! Greater Vancouver has many hidden treasures known only to its immediate environs. One such treasure is the Ivan Franko Lending Library housed on the mezzanine of the Ukrainian Community Society of Ivan Franko in Richmond, BC. And the Society is thrilled to invite the community at large to the library's Grand Opening Sunday, November 21, 2010 at 2 pm. Located at 5311 Francis Road, the Society was founded in 1937 in the middle of what was then a thriving farming community on Lulu Island. It adopted the name Prosvita (which in Ukrainian means "enlightenment") and modelled itself on the reading societies that sprang up in 19th century Ukraine. These societies promoted education and literacy amongst Ukrainians newly emancipated from serfdom in the Hapsburg Empire in 1848-9 and the Russian Empire in 1861. Some of the activities included readings from books and newspapers to educate the illiterate and keep them apprised of current events. For nearly 75 years, Richmond's Ivan Franko society has been a popular gathering place for Ukrainian immigrants and their children. Over the years, many members would donate precious books to the Society's library for posterity and future generations. During this past year, volunteers have been working to modernize the Society's library and its holdings. Now the small but impressive collection of books on Ukrainian literature, culture, and history (in Ukrainian and English) is electronically catalogued, shelved and ready for circulation. At the Grand Opening you can enjoy great cameraderie as well as refreshments and door prizes. As well as an opportunity to browse through the library's collection, Coquitlam author Mirko Petriw will be on hand to sign copies of his recently released novel, a political thriller called Yaroslaw's Treasure. Make sure to treat yourself to one of Greater Vancouver's delilghtful treasures. Just please RSVP to Theresa at 604-295-0693 before November 14, 2010. The Ukrainian World Congress (UWC) expresses serious concern about the events surrounding the imminent local government elections in Ukraine. On October 31, 2010, the first nationwide elections being organized and conducted by Ukraine's new government. These are elections to the Supreme Council of the Autonomous Republic of Crimea, local councils and the positions of village, township and city Mayors. UWC adds its voice to the alarm expressed by Ukrainian and international organizations over the undue influence being exerted by governmental structures on the election campaign. They are concerned that the Yanukhovych government is implementing changes which may result in the elections falling short of international standards. 1) The 15-member CEC should be composed of members from all political parties with seats in the national parliament. This requires the appointment of a new CEC and amendment of the law on appointing the CEC's 15 members so that the 15 political parties in parliament are each allocated a spot on the election commission. 2) Electoral law should allow voting at home only for individuals with documented proof of certified medical conditions. Any voting conducted outside of polling stations should be supervised by no fewer than five members of the local polling station commission. Electoral law should also clearly state that a quorum for decisions made by election commissions on Election Day constitutes a simple majority of all commission members. 3) Territorial and polling station election commissions should be re-formed according to the principle of equal representation, i.e. one commission member per political party, including those not in parliament. 4) Leadership positions in the territorial and polling station election commissions should be open to all political parties running in the elections with equal distribution of quotas for these positions among all parties. 5) Interference of government structures in the internal affairs of political parties should cease immediately. The real local branches of the "Batkivshchyna" party should be registered immediately in Kyiv, Lviv and Luhansk oblasts. Duplicate copies of party seals and registration certificates held by former party members should be destroyed without delay. In accordance with the principle of Rule of Law, UWC calls on President Victor Yanukovych as the Guarantor of Ukraine's Constitution to heed the aforementioned concerns and ensure the elections are free, fair, open and democratic. In addition, UWC appeals to all citizens of Ukraine to take responsibility for their state's future by exercising their right to vote and demanding that elections are held according to democratic legal principles. Excellent choices for the Shevchenko Medal, the highest form of recognition that can be granted by the Ukrainian Canadian Congress. Congratulations to th recipients, as well as those of the Ukrainian Canadian Youth Leadership Awards. Recipients have been invited to receive their awards at a ceremony to be held on November 6, 2010 at the XXIII Triennial Congress of Ukrainian Canadians in Edmonton, Alberta. The Shevchenko Medal recognizes individuals of Ukrainian and non-Ukrainian descent, as well as institutions and organizations, for their outstanding national contribution towards the development of the Ukrainian Canadian community. Outstanding achievement is measured by the recipients' level of excellence and initiative, their sustained body of work, peer recognition and the recipients' broad impact inside and outside the Ukrainian Canadian community. Shevchenko Medals are awarded in the categories of Community Development, Culture and the Arts, Education, Sport, and may also include the category of public service. The Ukrainian Canadian Youth Leadership Award gives recognition to young adult Ukrainian Canadians for outstanding leadership which significantly contributed to the broader Ukrainian community and the betterment of Canada. The Awards & Recognition Committee and the Shevchenko Medal Jury consisted of Chair lRoman Melnyk (Toronto), Radoslav Zuk (Montreal), Borys Sirskyj (Ottawa), Halyna Kvitka Kondracki (Toronto), Lesia Szwaluk (Winnipeg), Adrian Boyko (Saskatoon), Marko Levytsky (Edmonton). All jury members are past recipients of the Medal and provided expertise, community experience and geographic representation. Bill (Wasyl) Diachuk of Edmonton ... in recognition of his dedicated and inspired community work, his commitment to public service as a Member of the Legislative Assembly of Alberta, his active participation as a fundraiser, leader and volunteer. His exemplary initiative in helping the less fortunate in South America and Ukraine as well as his leadership with immigration and settlement issues have enhanced the fabric of Alberta and all of Canada. Walter Kish of Oshawa ... in recognition of his dedicated community activism, especially his contributions as a journalist, author and columnist. Walter has been a leader in the Ukrainian National Federation of Canada, the Canada Ukraine Foundation, and the New Pathway newspaper. Orest Warnyca of Regina ... in recognition of his contribution to numerous Ukrainian Canadian organizations, and especially for his outstanding leadership in the Ukrainian Canadian Congress and the Ukrainian Self Reliance League of Canada. Special recognition is given for his efforts to have the Government of Saskatchewan recognize the 1932-33 Holodomor as an act of genocide. Roman Brytan of Edmonton ... in recognition of his contribution to music and cultural celebration as host and producer of a daily Ukrainian program in Edmonton. Roman has also conceptualized major arts festivals and cultural programs and has promoted, encouraged and helped grow Ukrainian culture and arts in Canada, including the establishment of the Alberta Council for the Ukrainian Arts. Halya Kuchmij of Toronto ... in recognition of her significant contribution to arts and culture as a director and producer of films. She has directed and produced over 70 films many of which have been on Ukrainian/Ukrainian -Canadian themes. Halya's films have been instrumental in disseminating widely the culture, beliefs, and history of Ukrainians and Ukrainian Canadians on issues such as the Millennium of Christianity in Ukraine, the Chornobyl disaster, and the life of William Kurelek. Myron Momryk of Ottawa ... in recognition of his significant contribution in shaping and developing the Ukrainian holdings of the Library and Archives Canada. Myron oversaw the single largest archival collection dealing with Ukrainian Canadians, an invaluable source of documents critical to the history of Ukrainians in Canada and Ukraine-he has guided generations of historians and researchers through these collections, contributing to a better understanding of issues such as migration, Canada's First Internment Operations, and Canada's policy of Multiculturalism. Dr. Valerian Revutsky of Vancouver ... in recognition of his significant contribution in supporting and popularizing Ukrainian culture in Canada, for his works as an author of several books promoting Ukrainian theatre and culture in Canada and across the world. A Holodomor survivor, Dr. Revutsky has also written on the 1921-23 famine in Ukraine. Dr. Lubomyr Luciuk of Kingston ... in recognition of his unparalleled success in informing Canadians about Canada's first national internment operations, and his work navigating the historic Internment Act and its $10 million settlement. Dr. Luciuk is the Chairman and co-founder of the Ukrainian Civil Liberties Association and author of dozens of books and countless articles. He has led many successful campaigns to set the historical record straight on topics such as the Canadian immigrant experience, the Holodomor, Ukraine's struggle for national liberation and Canada's first internment operations. Dr. Manoly Lupul of Calgary ... in recognition of his instrumental role in furthering knowledge and understanding of Ukrainian Canadian issues. As founding director of the Canadian Institute of Ukrainian Studies, Dr. Lupul was instrumental in leading the field on the history of Ukrainian Canadians, multiculturalism and bilingual education. Dr. Bohdan Medwidsky of Edmonton ... in recognition of his tireless work in supporting Ukrainian education in Canada. As founder of the Ukrainian Folklore program and the Kule Folklore Centre at the University of Alberta, Dr. Medwidsky has stimulated and led research on Ukrainian culture and folklore in Canada. He has written extensively on Ukrainian folklore, folksongs and folktales. Dr. Roman Serbyn of Montreal ... in recognition of his leadership role in the field of education on the history of Ukraine and his tireless work on researching and publicizing the 1932-33 Famine in Ukraine as genocide. Dr. Serbyn is a world renowned expert on the Holodomor, as well as having pioneered research on the 1921-23 Ukrainian famine, and on the topic of Ukraine and WWII. Lucas Makowsky of Calgary ... in recognition of his achievements in the category of sport. An Olympic Gold medallist in speed skating, with a number one ranking in several distances in Canada, Lucas has excelled at the highest levels of athletic competition. This is reinforced by his strong involvement in the Ukrainian community through the dance ensemble Tavaria, Ukrainian Camp Trident and practicing the rich Ukrainian Orthodox traditions that he cherishes. Michael Slipchuk of Toronto ... in recognition of his achievements in the category of sport. As a world class figure skater, figure skating coach and Director of high performance for skate Canada, Michael has been an international ambassador for skating. In addition, Michael was the team leader for the multi medal winning 2010 Canadian Olympic figure skating team. An Edmonton native, Michael has been involved in CYMK, and danced with the ensemble Zirka. Leo Ledohowski of Winnipeg ... for his contributions in raising awareness of Ukrainian issues and philanthropy. Mr. Ledohowski produced the Holodomor DVD Documentary "Vichna yim pamyat", has made significant contributions to the Canadian Museum of Human Rights and promoted Canada's multicultural character by supporting Ukrainian Canadian Arts. Mr. Ledohowski is a prominent philanthropist and accomplished Canadian business person. He is the President and Chair of Canad Inns and serves on the Board of Directors of the Bank of Canada. James C. Temerty, C.M.,Toronto ... for his lifelong support and leadership within the Ukrainian Canadian community. He was chairman of the Ukrainian Centennial Fundraising Campaign and chaired the 2004 Ukrainian Election Observers Campaign, facilitating 500 private sector election observers to the Orange Revolution presidential election. He was instrumental in launching the Kyiv Mohyla Business School of which he serves as Chairman of its Advisory Council and is a Trustee of the Children's Hospital of the Future in Kyiv, Ukraine. Mr. Temerty is Chairman of the Board of Trustees of Northland Power Income Fund, Founding Chairman of UCC's National Advisory Council and was the Chairman of the Royal Ontario Museum Board of Governors. He is a recipient of many honours including Member of the Order of Canada. Borys Wrzesnewskyj of Toronto ... for his lifelong support of the Ukrainian Canadian community and Ukraine's struggle for independence and democratic development. He has provided financial support to Ukrainian organizations and played a leading role advocating on behalf of the Ukrainian community with the government of Canada. A federal Member of Parliament since 2004, Borys has been instrumental in receiving government support for important issues to the Ukrainian Canadian community, including the 2004 Ukrainian observer mission to Ukraine, recognition of the Holodomor by Parliament as a genocide and seeking commemoration and acknowledgement for Canada's first national internment operations. The Ukrainian Canadian Congress presents the Ukrainian Canadian Youth Leadership Award recipients for outstanding leadership and congratulates the jury for their work on the awards. The jury panel included: Chair Roman Melnyk (Toronto), Radoslav Zuk (Montreal), Borys Sirskyj (Ottawa), Halyna Kvitka Kondracki (Toronto), Lesia Szwaluk (Winnipeg), Adrian Boyko (Saskatoon), Marko Levytsky (Edmonton), Mychajlo Hantsch (Calgary), Robert Wuschenny ( Regina). Adriana Luhowa, of Montreal for her work with PLAST, SUSK, Help us Help the Children, and with McGill and Concordia Ukrainian students unions. In addition, she successfully organized a charitable fundraiser for Ukrainian orphanages and was the main videographer for the documentary film on the Holodomor, "Genocide Revealed". Olyana Grod of Mississauga for her work in positions of increasing responsibility and leadership in Ukrainian Youth Association CYM, including being the current national president. In addition to being instrumental in organizing the 2010 CYM World Jamboree, Olyana has been actively involved in the community, having organized Holodomor Education Week and Ukrainian Independence Day celebrations at Queen's Park. She has served on the executive of SUSK and has currently begun an internship with the Canadian Urban Institute in Kyiv. Andrijko Semaniuk of Winnipeg. Andrijko has been active in the Ukrainian Youth group CYM and sits on their national executive. A business student at the University of Manitoba, Andrijko is also a member of the musical troupe Zrada which has travelled across Canada and the US as well as performs with the Hoosli male chorus. He is active in the Catholic community, having served as an altar boy and member of the choir at Sts. 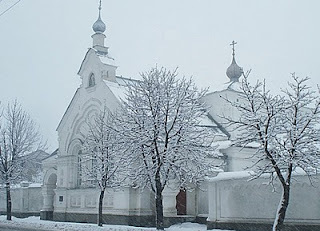 Vladimir and Olga Cathedral. Roman Storoschuk of Alberta. Roman is currently studying Philosophy at the University of Calgary. He is also vice-president of the University of Calgary Ukrainian Student's Society. Roman is also actively involved with the Ukrainian Canadian Student's Union (SUSK). Roman has been profoundly involved in Plast - Ukrainian Youth Scouting Organization, where Roman is a councillor for both the younger and older youth. Roman has been involved with the Ukrainian Canadian Professional and Business Association of Calgary, The Ukrainian Canadian Civil Liberties Foundation and the Calgary Ukrainian Festival. Congratulations to all these deserving individuals! after placing a jar of grain on the "Sad Memory of Childhood"
Stephen Harper, Prime Minister of Canada, and Viktor Yanukovych, President of Ukraine, announce a Youth Mobility Agreement between their two countries. This new agreement will give qualified Canadian and Ukrainian citizens, aged 18 to 35, more opportunity to travel and work in each other’s countries. Prime Minister Stephen Harper meets with Yulia Tymoshenko, Leader of the Opposition in Ukraine. Prime Minister Stephen Harper announced today that Canada and Ukraine have signed a new agreement that will give young people more opportunity to travel and work in each other’s countries. 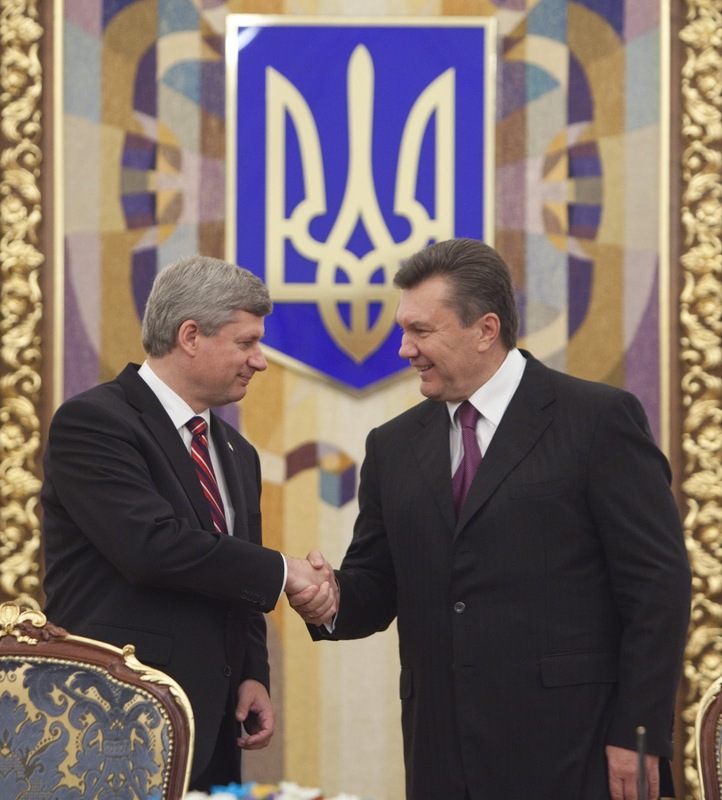 The announcement was made following a bilateral meeting between Prime Minister Harper and Victor Yanukovych, President of Ukraine. The Memorandum of Understanding, which is expected to come into effect next year, will simplify and facilitate the process for qualified Canadian and Ukrainian citizens, aged 18 to 35, to travel and work in the other country for up to one year. Participants will gain a better understanding of the other country’s languages, culture and society and benefit from professional and personal development. To date, Canada has entered into 30 other bilateral arrangements on youth mobility through the International Experience Canada initiative. The Prime Minister also used the opportunity to announce that the next phase of negotiations towards a Free Trade Agreement with Ukraine will begin December 13. 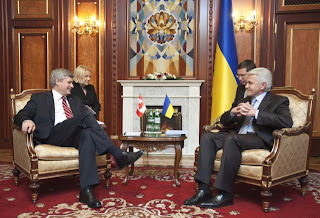 The first phase of negotiations between Canada and Ukraine on this agreement began in May 2010. This year marks the 119th anniversary of Ukrainian settlement in Canada. Canada was the first Western country to recognize Ukraine’s independence, which attests to the close ties the two countries enjoy today. This was a most amazing show! So glad I had the opportunity to see these outstanding performers. They're still touring Canada, so if your town is one they're slated to visit, make sure not to miss this show! In the meantime, enjoy these clips of the Vancouver performance. If you're pledging to the United Way (or All-Charities in Manitoba) through your payroll deduction, do consider the Ukrainian Canadian Foundation of Taras Shevchenko. Here is the link to the CRA website: http://www.cra-arc.gc.ca/chrts-gvng/lstngs/menu-eng.html. Just type in their name - Ukrainian Canadian Foundation of Taras Shevchenko - and it will take you to the registration number. If you have any questions or difficulties with the online procedure, call Halyna Kinasevych, Executive Assistant of the Shevchenko Foundation at (204) 944-9128, send here an email. Your generous donation will provide a lasting gift to Canada's Ukrainian community. If you're not familiar with the significant contribution the Foundation makes to Canada as well as its Ukrainian community, you can get a good overview at their website. According to this recent article, the prime minister of Ukraine has issued an edict forbidding Ukrainian television stations to lampoon Ukrainian politicians. Yes ... decent, civilized people will find such a scenario absurd and unbelievable but, unfortunately, it's quite true. Ukrainian Prime Minister Azarov announced the news on Sept. 21. Pity the Ukrainian people who dared hope that this crop of politicians might have some interest in advancing their country. Can anyone living in a modern democracy imagine television stations being forbidden to produce comedies about their country's politicians? Western politicians have thick enough skins that they have no problem allowing citizens to laugh at them. They also have enough confidence and maturity to be able to laugh at themselves and sometimes even join in the lampooning. Now granted, Ukrainian citizens have a grim sense of humour (a byproduct of the soviet era) so most of them would probably consider TV shows lampooning their politicians overkill anyway. They are already laughing at their politicians (albeit bitterly). As is the rest of the world. These Ukrainians definitely can dance! Virsky, Ukraine's National Dance Company, will kick off their 2010 Canadian concert tour October 7 in Vancouver! The Vancouver concert happens at the Vancouver Centre for Performing Arts, 777 Homer Street, Vancouver. Showtime is 7:30 pm. This year’s Toronto Ukrainian Festival attracted a record breaking audience of 516,441! In its 14th year, the 2010 festival saw visitors from Canada, the USA and abroad during the weekend of Sept. 17-19. “There is no doubt that the headline band from Ukraine Mad Heads XL as well as a very strong performer line up helped to bring the people to the Bloor West Village and our Festival," said Jurij Klufas, Chairman of the festival. “Our unique programming concept presents non-stop programming of Ukrainian music, song and dance from the very beginning to the very end of our Festival,” he said. The Toronto Ukrainian Festival, being the largest Ukrainian festival in North America, never fails to attract politicians of all stripes. Mark Warawa, Conservative MP from Langley B.C. and Chair, Canada-Ukraine Parliamentary Friendship Group brought greetings on behalf of Prime Minister Harper and the Government of Canada. Gerard Kennedy, Liberal MP for Parkdale-Highpark and Jack Layton, Leader of the NDP praised the Ukrainian Canadian community's contribution to the building of Canada. “This was the largest parade to date with TV food celebrity Ken Kostick leading the way,” said Parade Manager Tamara Mischena. The winning non commercial entry was Desna Ukrainian Dance Company of Toronto who incidentally are celebrating their 35th anniversary. The winning commercial entry was Buduchnist Credit Union. Volunteer Manager Anna Heychuk was very happy with her crew of dedicated volunteers who began their shifts as early as 8 am daily and continued to 1 am on Friday and Saturday nights and until midnight on Sunday night. In addition to the local Bloor West Village restaurants, businesses and services, Vendor/Kiosk Manager Irene Nazarewycz made sure to provide lots of tasty food and interesting shopping options. The Kozak Beverage Garden was operated by the Parents Committee of the Ukrainian Youth Association of Mississauga. This year’s Main Stage emcee’s were Ryan Boyko, Justina Lewkowicz and Marta Czurylowicz. The youth program emcee’s were Odesa Kelebay and William Pidzamecky. For more information visit the festival’s website. On last night's show we got a fab audio "sneak preview" of the upcoming concert and tour of the Virsky National Dancers of Ukraine. Also, two lucky listeners won free tickets to Virsky's October 7 concert in Vancouver. The Vancouver concert kicks off their 2010 Canada tour. I just popped the tickets in the mail today, and will be giving away one last pair of tickets to another lucky listener on Nash Holos next Sunday. Marina Lewycka's newest book, We are all Made of Glue, is the focus of Irena Bell's Чи знали ви? (Did Your Know?) feature. Proverb of the week, upcoming events in Vancouver's Ukrainian community, and plenty of great Ukrainian music! A Kyiv Post article reports that some two dozen of Ukraine's neantherthals came out of their caves last night, taking baseball bats to a rock festival last night in Irpen, a town outside Kyiv. These thugs injured several security guards severely enough that they required hospitalization. The neanderthal elements in charge of the state police have, of course, made no arrests. Which kind of makes one wonder just who instigated this attack. It is heartbreaking to see Ukraine being dragged back into the dark ages. It is equally disgusting that no western government can seem to fathom the global implications, much less possesses sufficient balls to take a stand. This includes our own Prime Minister who either doesn't know or (more likely) doesn't care enough about human rights and press freedom violations to do more than pose for a photo with Ukraine's current president. You'd think he could at least mention these violations in one of his statements of Canada's concerns. When Ukrainian music lovers can't safely enjoy an outdoor music concert, and politicians accuse Ukrainian rock bands (of all people!) of "promoting fascism and xenophobia" it's a huge step back for democracy. Here in the west, celebrities are (so far) free to criticize politicians and the government and call them to account. But Ukraine's current government prefers to live in a time warp. It appears that few politicians in the former soviet union are willing to allow this kind of freedom. Those who are willing to don't last long in office. It's clear this current regime appears bound and determined to bring back the "glory days" of the old soviet union... when intimidation tactics and thuggery were the modus operandi of the state. OTOH maybe it's not a step backwards. Seems like not much has really changed since the collapse of the iron curtain ... except to get worse. Ditto the indifference of western governments. The Vancouver branch of the Ukrainian Catholic Women’s League invites you to their Vintage Bridal Gown Fashion Show and High Tea on Sunday September 26, 2010. It takes place at 2:30 pm at St. Mary’s Ukrainian Catholic Centre, 3150 Ash Street in Vancouver. This unique event will feature bridal gowns going back to the early 20th century and continuing up to today. Young women in the local Ukrainian community will model several vintage gowns. Other gowns will be on display along with traditional Ukrainian wedding artifacts and photos. As well, there will be a “Guess Who the Bride Is?” contest. To wrap up the show, Svitanok Chorus will sing pre wedding songs and feature a reenactment by a soloist “bride to be” from their musical Vinkopletennia, a traditional Ukrainian bridal shower. The High Tea following the fashion show will feature delicious home-made delicacies by the ladies of the parish. Tickets are $10 for adults and $4 for children under 12. Please book in advance and help the ladies prepare enough food. Tickets are available from Sophia at 604 568-2034, Nadia at 604 432-7144 or Ann (Kvitka) at 604 925-2581. This amazing spectacle never fails to send shivers down your back as those horses come galloping out of the woods to the sound of cannons firing. Not a usual sight or sound in the rolling hills and farmlands of Manitoba ... except during Canada's National Ukrainian Festival in Dauphin. The people in this charming documentary about the Ukrainian community in North Port, Florida could be about my own family. Yet they are total strangers living in a different country three time zones away on the other side, and end, of the continent! The video came to me from a friend in Victoria, who received it from a friend of hers (also a stranger to me) in Edmonton. The way the internet connects people, these folks may not be strangers for long! Hope you enjoy this story as much as I did! This TV special about them is in Ukrainian but even if you don't understand the language, you'll understand the universal language of the music. If you are anywhere near Toronto this coming weekend, do not miss the chance to see this amazing musician perform live. I have a couple of his CDs... which get a fair bit of airplay on Nash Holos. They are incredible enough as it is, but no comparison to seeing him on stage. So if you haen't yet, you can only imagine! The first time I saw him was back in 1993, in Vancouver's Centennial Theatre. At the time he was with the Hopak Ukrainian Folk Dance Company of Ukraine. The troupe disbanded shortly thereafter, presumably due to a good number of members falling in love with Canada and deciding to stay. However, the show was, in a word, spectacular. One of the acts was this young man sawing away on a violin ... and the way the hairs stood up on the back of my neck, I just knew that wouldn't be last I'd see or hear of him. He settled in Toronto, where he developed a cabaret act calling himself Papa Duke. I'm told he has since recently relocated to Ottawa. An earlier post I did on him just ahead of his concert in Hamilton last year featured a few videos of him performing.